The basic problem was simple - I needed a rack to hold my growing CD collection. The real problem was that I didn't like any of the typical CD holders I saw in stores. The vast majority of them had two things in common - (1) they tended to be tall, shallow and thus unstable, (2) they held the CD on-edge so that all that could be seen is that narrow strip of text on the spine of the plastic jewel case. I wanted something sturdy enough to stand on its own without fear of toppling over due to an accidental bump and I like seeing the covers. As it turns out, solving the latter problem also takes care of the former. To see the CD covers, I decided to use flip-style CD holders. These are available from many hobby and woodworking suppliers. The ones I used hold 20 CDs and measure about 14 inches in length. That length, combined with the rest of the structure guaranteed an overall heft large enough to be extremely stable. Below is a brief description of the unit as I built it. The only pictures I have were taken after the unit was completed so there are no pictures of intermediate construction steps. The unit itself is scalable - both in terms of capacity and in terms of construction quality and appearance. More on this later. I won't provide step-by-step instructions on making one of these units. Instead I'll provide information on what I did to get the end product. This should allow anyone to adapt the design to fit individual needs. All measurements are approximate as everything is ultimately made to fit, not to some preconceived measurement. Overall Dimensions - Approximately 33-1/2 inches wide (including overhang of top), 18-1/4 inches deep (including overhang of top), 34-1/4 inches tall. Basic Materials - Low cost is good. The bulk of the unit is made from one 4ft x 8ft x 3/4 inch sheet of furniture grade oak plywood. This sheet was ripped to form four drawers bottoms, four drawer fronts and two side panels. The rear is made from two 2ft x 4ft sheets of 1/16 inch of hardboard (my local Home Depot didn't have 4x4 sheets and 2 smaller sheets were easier to carry in my car). The top is two laminated sheets - 1/2 inch furniture grade oak plywood and 3/8 inch furniture grade cherry veneered plywood. Both are leftovers from other projects. The rest of the visible wood is random leftover cherry and mahogany. Using furniture grade veneered plywood greatly simplified the overall construction - the veneer looks great and I didn't have to worry about wood movement (from environmental changes) on the side panels. The Drawers - The drawers are the heard of the unit so they were designed first. Everything else simply wraps the drawers. 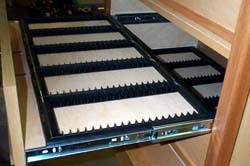 The unit has four drawers, each holds 5 flip style trays of 20 CDs each. The overall capacity is 400 CDs (100 per drawer). Each drawer sits on full-extension slides. This is important - you want to be able to reach the very last CD and regular 3/4 extension drawers won't let you do that unless you give each drawer lots of extra height clearance for your hand to reach the rear. I bought my drawer slides from Woodworker's Hardware. Each drawer is entirely open except for the front. There are no sides or back. I did this purely for construction simplicity. 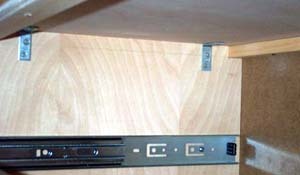 The drawer slides are screwed directly into the 3/4 inch drawer bottom's (plywood) edges. 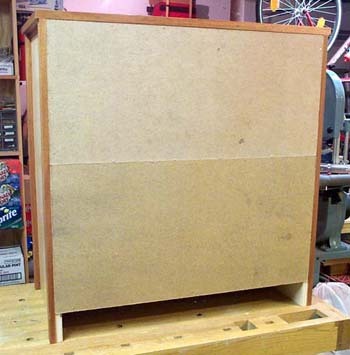 The drawer front is also made from the same 3/4 inch plywood and is screwed into place from the front with 3 screws. The screws are then covered with a strip of cherry acting as an accent piece. Since the drawer pull sits about 2 inches above the drawer bottom I added two metal "L" brackets on the drawer's inside to prevent torque on the drawer pulls from ripping the drawer fronts off. This is especially important since most drawer slides have a notch in the closed position that requires an extra tug to open. The "L" bracker is a 1 inch x 1/2 inch unit from the local ACE Hardware store. Aside from stiffening the drawer front, it also helps align the front to be perpendicular to the drawer bottom. The drawer pulls were a clearance item from Lowe's. The drawer front is 30 inches wide 6-3/8 inches high. 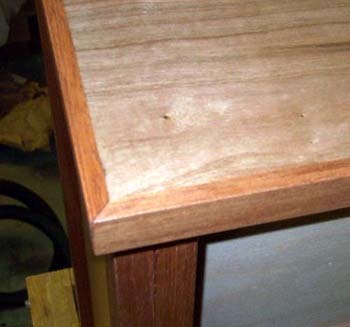 Each slide is 1/2 inch deep so the drawer bottom is 29 inches wide and 15-1/2 inches deep. This depth was chosen based on (1) the 16 inch length of the slides and (2) the 14 inch length of the CD tray. Note that the drawer front extends below the drawer bottom by about 1/2 inch. This was done to guarantee that the slides would clear the top of the next lower drawer (the slides are taller than the 3/4 inch thickness of the drawer bottom). This may seem confusing until you hold an actual full extension side and fully extend it. The height above the drawer bottom is about 5-1/4 inches which is enough for the CD and CD tray. Each drawer front has iron-on veneer applied to the top and sides to cover the exposed plywood edges. 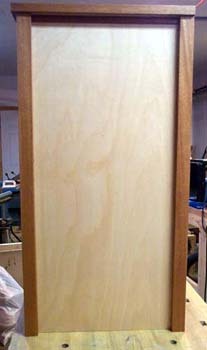 Side Panels - The sides are about as simple as can be. Each is a single sheet of 3/4 inch plywood extending from top to bottom. The four corners are trimmed with 3/4 inch mahogany to give the apperance of "legs" and to hide the exposed plywood ends. The picture from the rear shows the applique. 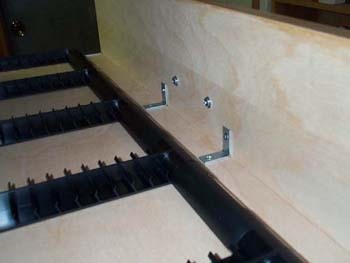 Bracing and Stability - Since all the weight rests on the sides via the drawer slides, it's important that the side panels transfer the load straight down and not wobble side to side. On the front, the two side panels are held in place by 3/4 inch (plywood) beams at the top and middle and a 6 inch kickboard at the bottom. I decided against recessing the kickboard since that would only complicate the construction of the side panels. The rear has the same side-to-side beams at the top and middle. The bottom is a little different - there is a small shelf that keep the side panels from twisting. At the top, the top panel acts to prevent this twisting motion. Back - The back is extremely simple. Here is a view. Two pieces of 1/16 inch thick hardboard span almost the entire space. 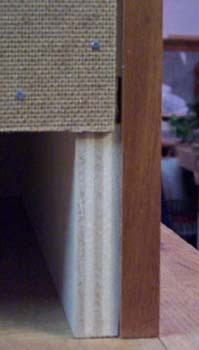 No rabbets were cut to hide the hardboard; rather the side panel applique simply covered the hardboard edges. The two pieces meet at the middle rear beam. Top - Admitedly the top was always an after-thought. I really didn't know what I would do until I had run out of other things to do on the project. I decided that I wanted to place some audio equipment on top of the unit. This meant the top had to be strong enough not to deflect too much with added weight. Holding stuff serves another purpose - it adds mass to keep the unit from tipping forward should all drawers be opened at once ! (I actually don't know if this will happen on my unit and I don't really want to try it !). I originally planned to use 1/2 inch oak plywood with an iron-on veneer edge. The oak proved to be too thin so I added a 3/8 inch cherry veneered plywood to form a 7/8 inch thick sheet. This sheet proved to be extremely strong. Thinking it over, I decided to go with the cherry side up plus a solid mahogany trim. The cherry and mahogany are similar in color (the cherry will darken over time) and contrasts well with the oak. One important requirement for any top is that it be able to support the weight of the unit when transporting it. I used four 1-1/2 inch x 1/2 inch "L" brackets to secure the top of the side panels. Finish - Simplicity was important here. No stains, no oils, no dyes. I sanded to 320 grit and applies 5 coats of a Minwax water based clear semi-gloss polyurethane. Scalability and Design Consideration- I said earlier that the design is scalable. Here are some ways to change it, and things to consider. Width - You can easily go with a wider drawer. 3/4 inch plywood is pretty strong and CDs don't weigh that much. Of course there's a point where things become unwieldy both in use and in construction. Height - You can easily go taller by adding more drawers. Of course if you make it too tall, you won't be able to see the CD covers ! Weight - 100 CDs weighs under 20 lbs. If you make extremely large drawers, take the overall weight of the drawer (drawer + content) into consideration when buying the drawer slides. Slides are rated by capacity. Be sure to use extra screws to hold the slides in place. Appearance - You can dress the unit "down" by a exposing the plywood. Use wood filler and paint to finish the piece. 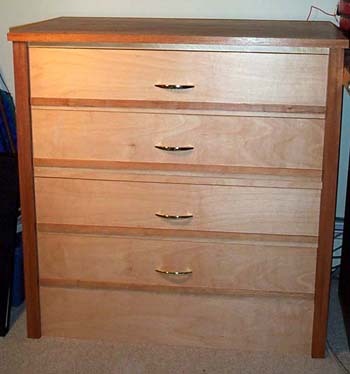 Or you can dress it "up" with fully dovetailed drawers and decorative legs. There are lots of possibilities. Mine is pretty much middle-of-the-road IMHO. Metal "L" brackets can be replaced with something more easthetically pleasing too. Slide Length - Pick your slide length carefully. Remember to account for the space in front of the first CD - you need this to flip it forward. You need to be able to reach the last CD in the tray. Remember that if the top overhangs the chassis as mine does, you'll likely have less clearance with the top-most drawer ! Support of Top - Be sure to stiffen the top if it is to bear large loads. If it deflects too much under load, it can prevent the top drawer from opening and closing properly. Construction Considerations - There are a few things to take into account while building something like this. Dust and Dirt in Slides - Drawer slides usually come lightly greased. If you have to install them before the unit is complete (like me ! ), do your best to keep dust and dirt out of the mechanism. I taped mine up with masking tape when they were exposed and vacuumed them frequently. Matching the travel of the left and right slides on each drawer can be tricky. Take some extra time and get this right. It'll make the drawers open and close that much smoother.